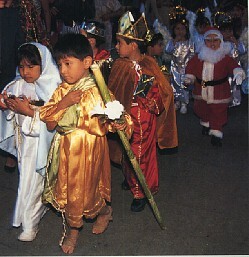 This 9 day festival is central to Navidad (Christmas) celebrations in Mexico. This is a neighbourhood festival that commemorates the journey of Mary and Joseph, who could not find posadas, (Spanish for “lodging”) before the birth of Jesus. A procession, including people dressed as Angels, Saints and the Holy Family, marches through the neighbourhood, knocking on doors looking for a place to stay. Like Mary and Joseph, they are refused, until finally the parade ends at one home where they are welcomed in. Feasting ensues, including a pinata for the children.